Vic Smith drew attention on this site recently to a review of the Harry Cox CD on Rounder which was crass and ignorant. Nevertheless, apart from the ill-judged attempts at humour, the review probably reflects the reaction of the Man on the Clapham Omnibus if faced with music of this sort. A reviewer with the appropriate knowledge has acquired that expertise because he or she has spent years and decades immersed in the music for the simple reason that they love it. They are therefore likely to be favorable reviewers, as can be seen from the many printed reviews of virtually homemade CDs by competent floor singers who have produced a small run of 100 copies for the pleasure of family and friends. Nothing great, but welcome to the insatiable enthusiast. As Al Sealy used to say, "If you like these sort of songs, then these are the sort of songs you'll like." It is no accident that the word 'critic' has come to mean 'opponent' rather than its original meaning of 'judge'. For well over 2000 years the proponent of adverse views has claimed the persona of the courageous and independent free thinker while the supportive voice is seen as that of the gullible lackey. Furthermore, every creative or sporting activity now supports a parasitic growth of experts, critics, commentators, pundits and journalists whose main purpose is to justify and further their own profession. What chance is there then of an informed review which is critical in the real sense? I feel it can be more useful to look at broader issues, but first to the basics. Here are 53 tracks, running 148 minutes, featuring 16 performers, many of whom enjoy a deserved reputation as the finest traditional singers we were lucky enough to hear in the last decades of the 20th Century. All were recorded by Mike Yates between 1964 and 2000 and the CDs are packaged with a well-produced booklet giving full texts of the songs with brief notes and references after an introduction in which Yates briefly describes his relationships with the singers and their songs. Of these tracks 19 are available here for the first time. The highest profiles are those of Johnny Doughty, George Spicer, Frank Hinchliffe, Freda Palmer and Walter Pardon but these contribute just two of the previously unissued items, George Spicer's My Old Man and the one track from Walter Pardon, Poor Roger is Dead, both from a schoolroom origin. I confess I had forgotten what a good singer Freda Palmer was. She was undemonstrative in her performance as her songs flowed out with total confidence and a complete absence of mannerism. 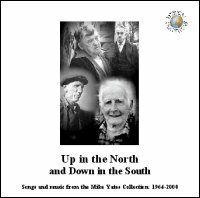 Up in the North is one of the best items in this collection as Freda weaves the tune around the irregularly formed verses. Hearing these singers again I have already dusted down the old vinyls as I have also for Harry Upton whom I had previously neglected until the four tracks here persuaded me that I had made a mistake. It took me a few minutes to work out why his Canadee-I-O was so familiar; it appears with an almost identical text on Dylan's much maligned Good as I Been to You! But what of the unissued material? Unless you are an obsessive completist you may take the view that hitherto unissued material is going to be second division stuff if it has been dormant for so long, the days of new recordings by singers 'all in their youth and prime' having vanished along with the dusty attics waiting to reveal their Jeffries concertinas and previously unknown 78s of Harry Champion. I suggest that thirteen tracks by three performers blow that theory out of the water! Finally there is Willie Beattie from Dumfriesshire with four big ballads. On first hearing the small uncertainties of pitch and breathing create a nervousness in the listener, but once the limited number of these is known it is possible to relax on further hearings and then the strengths appear. Johnnie Armstrong is beautifully paced, Dowie Dens has an exceptional tune in its first line, Kinmount Willie shows variety of pace in the storytelling, and The Brundenlaws shows equal skill in the lighter vein. Nothing here from the second division. So, to some broader issues. The title is 'Up in the North and Down in the South'. A clever play on the title of Freda Palmer's song? A contribution to the political debate on the North/South divide?? The North is represented by McBeath and Beattie from Scotland and the tunes of Harry Cockerill, but the only other significant contribution comprises the seven fine tracks from Frank Hinchliffe which all appear on his Topic album. So it's that Frank Hinchliffe, not the other Frank Hinchliffe. John Cocking and Will Noble have sat me down more than once and explained these namesakes, but I can't keep it in my head. I have the same problem with Sonny Boy Williamson. At least I know which Harry Corbett spent his professional life with his hand up a ..... But I digress. Listening to Hinchliffe brings to mind the singing of Ernest Yates and Will Noble. There is a discernible style here as there is in the South coast singers with the final exhalations which are prevalent in Johnny Doughty, evident in Harry Upton and were totally pervasive in Gordon Hall. I feel, however, that a big part of the North/South divide lies in the texts. I cannot recall a singer from the North stopping with the words "That's all I know of that one." The texts of Northern singers are often more complete and the repertoire feels more recent and in closer touch with written sources. The Southern singer seems more likely to come up with the inexplicable fragment. Does this suggest that the South is more dependent on oral transmission with all its accompanying amnesia? There's a thesis here somewhere; worth a PhD at least. Finally, this CD will, of course, be hated by Vic Smith's reviewer. Lets hope he is not asked to listen to it as it is not for him. The CD liner makes it quite clear that the purpose is to 'bring music which might never achieve a commercial publication to the small audience which values it.' A laudable aim. If you're sufficiently interested to have read this far then you're a part of that small audience and this CD will bring you pleasure and enhance your collection. I expect to return to parts of it over and over again. Mind you it has driven my family out of the house screaming in horror with their hands over their ears while I have been playing it, but that's my problem. Or theirs.